Of late, I have become a skeptic of the term content, especially this thing called ‘engaging content’. It wasn’t always so. In some of the first presentations I gave on social media some six or seven years ago I can remember my mantra was “get it a link, get it out there and get it working for you” – albeit the intent here was to try and get organisations to understand that content shouldn’t be highly produced and live on websites – it should be very low cost, produced in volume, launched from content hubs and live ‘out there’ in social (Google) space. Conversation, Content and Community were what I preached as being the Holy Trinity of social media. I was also, rather more esoterically, seeing content liberated from distribution channels as being a medium in itself. I called this floating, mobile, or wriggly content (see this post I wrote back in 2007 which I actually think is still quite relevant, not just for its assessment of the behaviour of liberated content, but also the developing importance of community and the need – still unfulfilled – for an integration platform). I guess my skepticism was born as I saw content strategies emerging and started to question the value of the actual content being issued, rather than the concept of having a content strategy. This content seemed to be little more than an extension of the sort of stuff we had always produced rather than content that supported what was actually going on in the social space, reflecting the needs and behaviours of the people (consumers or customers) within it. What people seemed to want in this space was information, not content, and they wanted access to it in real-time – not in content publication-schedule-time. This was because the relevance of this information was related to what they, as an individual, were doing (the questions they were asking) right now. Content marketing: Brandfill or information management? One can very easily get into a semantic argument about the difference between content and information, but putting this to one side, I think the best way to think about a content marketing strategy is to recognise that it is a spectrum. At the one end sits an approach that regards the challenge as being filling up all the new channels that are now available. It sees the fact that we now don’t have to restrict our communication to scarce and expensive channels (traditional media) as an opportunity to basically produce and distribute lots stuff. Now while this may be more varied (or ‘engaging’) than the diet served up in ads or press releases, it is still variations on a ‘this is us’ brand theme. And in-so-far as it strays way from the brand, it only goes into the territory that is deemed relevant to the lifestyles and interests of the ‘target audience’. Pampers, for example, will believe that it has permission or relevance to talk, not just about nappies (diapers) but also more widely about babies and childcare, despite the fact that there are many other much more credible places where this information is available, such as Mumsnet. In other words this content is similar to that which existed in traditional media channels, albeit this time it is brands, rather than media organisations, which are producing it. In fact, many people are starting to talk about brands as being media organisations. I find this somewhat ironic, given the relevance of media organisations is in decline and I can’t see that brands are going to breathe new life into the space. Why would you want assume the functions of a dying sector I wonder? The only difference this new brand content has from traditional media content is that it has ‘engagement opportunities’ tacked onto the end of it (“here is something we want to talk about – click this button if you like it”), in order to convince ourselves that we are being social and ‘engaging’ (I really do hate that ‘word’). Success in the space is still measured in terms of reach and frequency: i.e. how many people we can get the content in front of and engagement is often being seen as the proxy measure of old-fashioned circulation, viewers or listeners. I would like to call this approach the Brandfill approach and doff my cap to Paul Armstrong who coined this term – because it is all about volume and filling-up spaces (with stuff no one really wants anymore). At the other end of the spectrum sits an approach that is more about information management and constructing a process that matches answers to questions. This is an approach that is based around supplying consumers or customers with what they want, when they want it and which recognises that they are an individual, rather than a member of an audience or a segment. I would like to call this approach the Information Management approach – because this is what it is and I can’t think of a snappier title for it. In determining where on this spectrum you want to sit, there are two things you need to be aware of. First, the easiest end of the spectrum to operate at is the Brandfill end. This is because what you do here is familiar. It doesn’t really involve doing anything new – just scaling up the process. You can also outsource large parts of it, thus it has the full weight of the agency sector behind it. On the other hand, operating an information management strategy is much harder. It is not the sort of process that most marketing and communications departments are familiar with, and it involves new types of skills, processes and people. The second thing you need to be aware of is that the further along the spectrum towards the information management approach that you move, the more value you are likely to create for the business and that if you are adopting a Brandfill approach you are quite possibly going to be pouring lots of money down the drain (or onto the garbage heap to extend the analogy). It is the same old story, the easy things to do are rarely the things that create the most value. There are, again, two reasons for this. The first is that the concept of content is inextricably bound up with the concept of an audience. Content is something that is consumed, en-masse, by large numbers of people. That is what is was designed to be and it was designed this way because the only channels we had available to distribute information were mass, audience-based channels. Marketing (and journalism and all forms of publication) was an exercise in putting messages (content) in front of large numbers of people, usually at a time dictated by the requirements of the channels – i.e. TV and radio scheduling, print runs, mail-shots etc. rather than at a time dictated by the requirements of the audience. What we understood as content has to have an audience to make it work and it was media that provided this – because traditional media had an audience built into it. Media was a proxy for an audience – and sold itself as such. But social media doesn’t have an audience built into it and creating an audience within social media is very hard – because it runs against the grain of how social media operates. Traditional media was the world of the audience, but social media is the world of the individual. The people within social media are not looking to communicate with audiences, not do they usually want to become part of, or be treated as part of, an audience. They want to make connections with individuals, often within the framework of small groups of similar individuals drawn together as a result of shared interest (this can be interests of friendship or interests in finding a good, cheap restaurant). Here is the killer, obvious, evidence of this. Last month Socialbakers published its latest Facebook performance leagues. It found that the average engagement rate for a brand Facebook post in the UK was 0.22 per cent. This is not 0.22 per cent of the brand’s target audience, this is 0.22 per cent of the brand’s Facebook fanbase – i.e. people who had already ‘liked’ the brand. Now for most brands, their Facebook fanbase rarely exceeds 1 per cent of total target audience – so this represents an engagement rate of 0.0022 per cent of the total target audience. Now, of course more people actually view Facebook content than engage with it (i.e. click a like or share button). I think it is currently estimated that one ‘engagement’ equals 50 actual views. This, incidentally, is one of the reasons engagement is used as a proxy for reach. So we can multiply our figure by 50 which therefore inflates it to the enormous figure of 0.12 per cent. 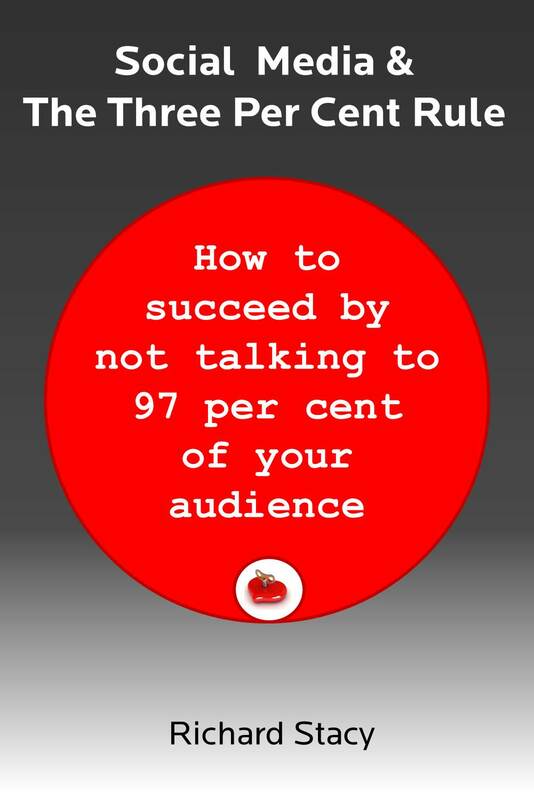 Facebook is a good way of reaching 0.12 per cent of your audience – i.e. effectively none of your audience. This isn’t a group that really qualifies as an audience, or even a segment. Or more precisely, it is not a group that qualifies for the receipt of content – because it doesn’t matter how engaging you may seek to make your content, the nature of content itself defines that it can never be engaging enough to justify placing it in front of only 0.12 per cent of your audience. Anything that is designed to be seen by a lot of people in publication-time, is never specific enough to respond to the needs of individuals in real-time. So the first reason why content doesn’t work in the social space is that social media hardly ever delivers the audience necessary to make content work. (This is because social media is not actually media – it doesn’t have any native support for what it is that media actually does – it is actually a form of infrastructure). Not only that, there are no target audiences in social media, because within the social space people don’t want to be targeted (even as an individual). Within the social space, the brand is the target: which brings us to the second reason why content doesn’t work in the social space – people are not requesting it or looking for it. When people are behaving as an individual, as distinct from a member of an audience, what they want from a brand is totally different. Mostly what they want is information, or a response to a request, or possibly even a conversation and they want this in real-time. Whereas as content is something that is passively consumed, information is something that is actively requested or sought-out. Individual consumers will either target the brand direct to get this information or response, or they will turn to Google. This means that brands need to have the processes in place to respond to direct, or even indirect, requests – or they have to have a process in place which makes sure that they have answers that sit within the Google spaces that accord with the relevant questions. In effect it means having a process in place that matches answers to questions in real time – i.e. an information management strategy. We need to follow the lead of Google here: its latest algorithm is all about making Google more effective in answering questions and its advertising (see the interactive stuff currently running on the London Underground) is all about encouraging people to use Google in this way. We should listen to Google – they know what they are doing. Brandfill is never going to figure in a Google space – at least not a Google question any consumer is ever going to ask. Also consider that the world’s largest content producer is probably still Demand Media. Demand Media simply listens to the questions the world is asking and works out which the most profitably ones are to answer. Of course, creating an information management strategy doesn’t preclude the fact that you will have to make some stuff that could be called content. You will need to have ‘content’ which answers the key customer questions – but simply producing and distributing this is not sufficient. You will need to have a process which continually inserts these content answers into the real-time question stream, either because this is directly requested (@brandX does you product do Y), or because this process of ‘socialisation’ of content is what is required to make a content answer rise to the top of the relevant Google question space. It may well be that in reality you only need 20 pieces of content, or more precisely have 20 questions you have to answer. But you will have to build a process around these answers so that they get matched to the spaces, or people, for whom they are immediately relevant. In effect you have to socially optimise your content and you don’t achieve this by simply cranking up the volume of stuff you produce, although you will probably need to produce more than 20 answers because you are unlikely to hit the Google sweet spot with just one content shot. In reality, this process involves a shift of emphasis. It is not about the stuff that you produce, it is much more about how you decide to produce this stuff and what you do with it once you have produced it. This back and front end (this process if you like) becomes far more important than just the production of the stuff itself. It is also worth remembering that you don’t create relationships with individuals on the back of traditional content – not relationships of any significant ‘social’ value. Of course, in traditional marketing, content was the only thing we could use to create relationships with our consumers and therefore the more creative we could make the content and the more people we could put it in front of, the more successful our brands were. This is why content (or creativity) was king in the traditional marketing space and it is probably the reason we remain obsessed with this concept of content. But looked at from the perspective of consumers, exposure to content may make us marginally more inclined to purchase a product, but it is rarely of sufficient value to represent any substantive reward or benefit, or form the basis for any sort of meaningful relationship. “In order to demonstrate just how valuable, special and unique you are to us as a customer, we would like to present to you this lovely piece of content, designed just for you (and maybe a few thousand other unique and special customers who are similarly valued).” Doesn’t really cut the mustard does it? Responding to customers’ real-time needs and answering their questions, rather than dishing up a diet of content, is the basis for creating valuable and sustainable relationships and this is the opportunity that the social space presents. As an aside, this leads us into this other emerging buzz-word space, which is ‘real-time marketing’. But as with content marketing, you need to take great care here. If you define this from a targeting perspective – i.e. how to get your message in front of people at the right time – you will probably not succeed. This is because, if you are being that precise in your targeting, i.e. targeting an individual at a relevant moment in time – what this individual will want is not anything that is conventionally associated with this thing we call marketing. Customer service, conversation, selling – these are things that can happen in real-time. But marketing? That can really only happen in real-time if it changes itself into customer service, conversation or selling. Probably the most important thing to recognise, when looking at a content marketing strategy, is that you need to understand that its output is defined as a process, not in the volume of stuff that you produce. 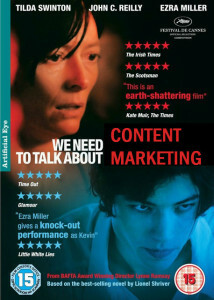 Building a socialisation process around content is the key to success and the foundation of this process is listening. You need to be able to identify what it is your customers or consumers are wanting or talking about right now. And you need to respond, either by joining the relevant conversations or by providing access to the relevant information – not by some industrialised, semi-automated, exercise that pumps out tonnes of Brandfill. Effective content marketing is all about a process of information management. Process and people (as is always the case in social media), rather than channel selection or communications outputs, are what defines success. Thanks for the nod, Rochard. I like very much your “lesson”: Responding to customers’ real-time needs and answering their questions, rather than dishing up a diet of content, is the basis for creating valuable and sustainable relationships and this is the opportunity that the social space presents.” A different approach to the theory of content marketing. Critical. Now, I start to think in a new way about the topic. Thanks.